Pompeo Announces Tightening Of Cuba Embargo The secretary of state said the administration must hold Cuba accountable for the property Havana seized in the wake of the 1959 communist revolution. 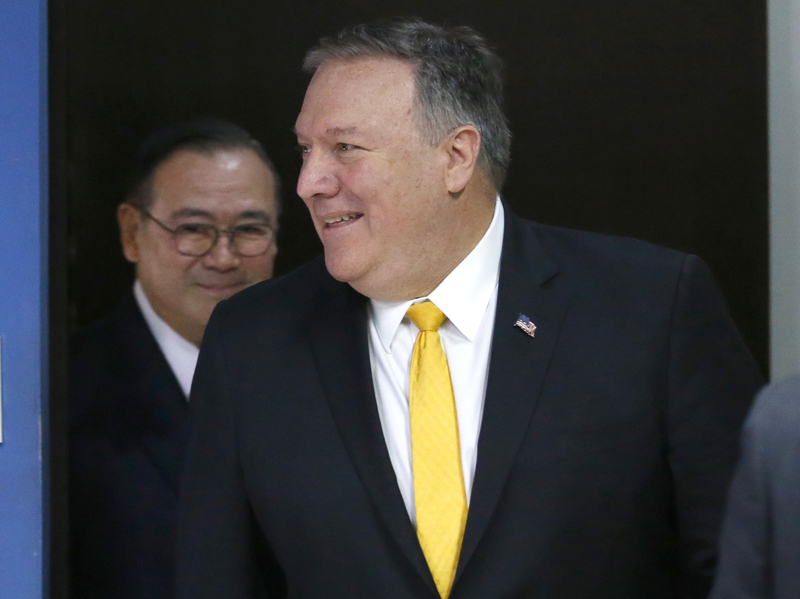 Secretary of State Mike Pompeo in the Philippines last week. The White House is tightening a decades-old embargo on Cuba but delaying for another month a decision that could put foreign companies invested on the island in legal jeopardy. Title III of the 1996 Helms-Burton (Libertad) Act would let Americans — including Cubans who have since become U.S. citizens — sue companies that "traffic" in property confiscated by Cuba after the country's 1959 communist revolution. For now, the Trump administration is allowing lawsuits only against Cuban companies that are already blacklisted in the U.S. because they are tied to Cuba's military and intelligence services. Foreign companies, however, are on edge since Pompeo's waiver runs only through April 17. "Today I announce an exception to the 30-day suspension of #TitleIII of the Libertad Act," Secretary of State Mike Pompeo wrote on Twitter, adding, "We must hold #Cuba accountable and make whole U.S. claimants for assets seized by the Cuban government. Doing business with Cuba is not worth trafficking in confiscated property." Until now, Title III has been suspended on a rolling basis every six months, but the administration last issued a 45-day waiver, which expires on March 19. Today I announce an exception to the 30-day suspension of #TitleIII of the Libertad Act. We must hold #Cuba accountable and make whole U.S. claimants for assets seized by the Cuban government. Doing business with Cuba is not worth trafficking in confiscated property. Lawyer Robert Muse said previous administrations wanted to avoid what he expects would be a "tidal wave" of lawsuits filed in U.S. federal courts in Florida. North Carolina Sen. Jesse Helms was the architect of Title III, and the purpose of it, said Muse, was to "prevent foreign investment going into Cuba by putting properties in Cuba into great uncertainty." Muse gave some examples: "If your grandfather had a sugar plantation expropriated in 1960 and someone is buying that sugar, dealing in the sugar, profiting from it, they can be deemed to be a trafficker, but also the government agency that oversees that sugar plantation today, say the Ministry of Agriculture, they can be sued," he tells NPR. European companies or banks that are headquartered in buildings that were previously privately owned could be at risk too. "That's why Senator Jesse Helms drafted it the way he did — to create fear and apprehension principally among European investors," Muse said. A State Department official said the U.S. consulted with partners in Europe, Canada and elsewhere. "The secretary was very clear that part of their concerns were a factor in his decision-making process." The official, who spoke to reporters on the condition of anonymity, would not predict how many lawsuits could be brought under this first step. The official said that under the Trump administration there have been no discussions with Cuba about these claims.